Los Angeles Valley College’s Child Development Center which received the Child Care Center Nutrition Garden Grant in June 2013, has embraced the edible school garden program as part of their curriculum and seen results that go beyond the classroom and affected the lives of children and staff. 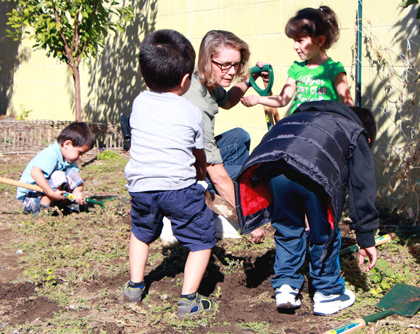 Download the California School Gardens Resource Guide free at the link below. Congratulations to the following Arizona schools. Each will receive $1,500 to grow and sustain their edible school garden. 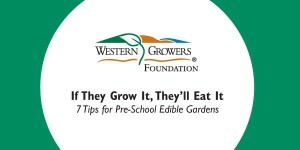 Western Growers Foundation (WGF) is working with the California Department of Education (CDE), Nutrition Services Division (NSD) to provide 100 garden grants of $1,000 each to eligible child care centers or preschools participating in the Child and Adult Care Food Program (CACFP). Click here to visit the Grants page. 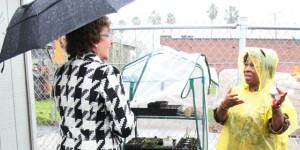 Through the generous support of HMC Farms, the Western Growers Foundation is opening up a competitive grant opportunity for Oakland Unified School District K-12 grade schools, to receive a $1,000 grant to grow and sustain an edible school garden. The grant application is available now through Jan. 31, 2013. Click here to visit the Grants page. Through a generous grant from the California Department of Food and Agriculture, Western Growers Foundation was able to award $600 to 100 California Head Start Centers. After visiting several centers, this video was created, "Seven Tips for Head Start and Pre-school Edible Gardens." Submit Your Recipe Today for Let's Move! Share your nutritious recipe with the First Lady! Visit Let's Move for details! The 2012 School Garden Grant Cycle is now closed. Awards will be announced no later than August 31, 2012. Good luck to all entrants! 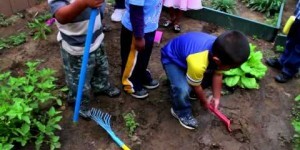 2012 School Garden Grant Application Now Available! 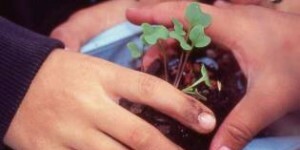 The 2012 school garden grant online application is now available! Click here to begin! Applications are due at 5:00 p.m. on May 31, 2012. Awards will be announced no later than August 31, 2012. The 2011 grant cycle is now closed for child care centers and preschools in California. Click here to watch the KTLA video. Thanks to the California Department of Education, Nutrition Services Division for all their support. At this time, there is no funding available for grants, but stay tuned for any future announcements. Thirty percent of children in the U.S. are obese, according to the American Journal of Medicine. Many children may think their food just comes from the grocery store. The Western Growers Foundation school garden program partners with farmers to support gardens in Arizona and California that promote health and nutrition. This has been a great way for children to learn and experience first hand the joys of growing fruits and vegetables.